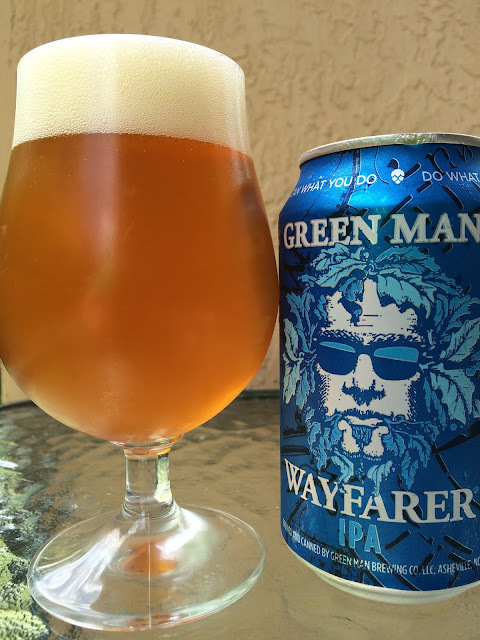 Today I'm checking out Green Man's Wafarer IPA. "Conceived in Asheville, NC." I suspect they put that on the can because I'm fairly certain the beer was brewed MAY/19/16 by Brew Hub in Lakeland, FL though that is no where to be found on the can. Nothing against contract brewing, but I don't like when facts are omitted. Fruity orange and melon aroma, lightly tropical, nice but you'll need to risk beer inhalation to get a good whiff. Fruity flavors to start as well, citrus, orange and again, that distinct melon. After a little sweetness up front, the bitterness really takes over with some pine and herbal flavors. Those linger into a dry finish and aftertaste. A little warmth takes some of the bitter edge off, adding a nice tangy component. Pretty nice beer!